Pick up the iPad with Retina display and suddenly, it's clear! You’re actually touching your photos, reading a book, playing the piano. Nothing comes between you and what you love. That’s because the fundamental elements of iPad – the display, the processor, the cameras, the wireless connection – all work together to create the best possible experience. And they make iPad capable of so much more than you ever imagined. 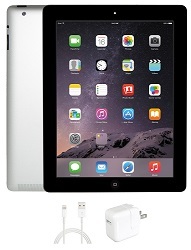 This refurbished Apple iPad is in excellent working and cosmetic condition and is ready for your immediate enjoyment. Performance is not the whole story. The iPad is sleek, beautiful and engineered to handle life on the go - thanks in large part to the aluminum unibody. By consolidating all of its parts into one, everything becomes less complex and far more precise. The result is an iPad that's thin, light, and durable enough for the ins and outs of everyday life. Part of every new iPad is the all-new Lightning connector. It’s much smaller than the 30-pin connector. And it features an all-digital, eight-signal design that’s significantly more durable. Another brilliant feature of Lightning: it’s reversible. Which means there’s no wrong way to plug in the cable. If you have an iPad accessory that depends on the 30-pin connector, you can still connect it to your new iPad. Simply use a Lightning-to-30-pin Adapter (sold separately). This refurbished Apple iPad is in excellent working and cosmetic condition and is ready for your immediate enjoyment. It includes a 90-Day warranty direct from the manufacturer/vendor. Everything you do with your iPad, you do through its large, beautiful display. And when the display is better, the entire iPad experience is better. The Retina display on this iPad features a 2048-by-1536 resolution, rich color saturation, and an astounding 3.1 million pixels. That’s four times the number of pixels in the iPad 2 and a million more than an HDTV. Those pixels are so close together, your eyes can’t discern individual ones at a normal viewing distance. When you can’t see the pixels, you see the whole picture. Or article. Or game. In ways you never could before. The new A6X chip inside is Apple's most powerful mobile chip yet. It delivers up to twice the CPU and graphics performance of the A5X chip. And it makes iPad feel faster and even more responsive. Apps launch instantly and run smoothly. Graphics-intensive games are fluid and lifelike on the gorgeous Retina display. And with improved image signal processing built into the A6X chip, the photos and videos you take with the 5-Megapixel iSight camera look sharper and even more Retina worthy. iPad features a 3.1-million-pixel Retina display and an advanced processor and graphics. How much of an effect does that have on battery life? Almost none. You still get up to 10 hours of power to read, watch, play, write, and create whatever you want! FaceTime on the iPad puts you face-to-face - even when you’re miles apart. And now with the new FaceTime HD camera, everyone can get an even better view of you and what’s around you. You can also use it for taking self-portraits or recording 720p HD video. The 5-Megapixel iSight camera features a backside illumination sensor that captures great-looking pictures whether by sunlight or candlelight. Autofocus, tap to focus, and tap to set exposure functions mean every photo you take instantly becomes frameworthy. And with built-in face detection that automatically balances focus and exposure across up to 10 faces, there’s more room for more grins. So everyone look at iPad and say “Cheese.” With the iSight camera, you can also capture all your precious, beautiful, and hilarious moments. In 1080p HD, no less. And with automatic video stabilization, your recording is free of bumps and shakes. Which is a big advantage when you’re laughing uncontrollably. Siri is the intelligent assistant who helps you get things done, just by asking. Talk to Siri as you would to a person: Ask “Do I need an umbrella?” or “Did the Giants win last night?” or “What time is the barbecue on Sunday?” Siri not only understands what you say, it knows what you mean. It figures out the right apps to use to find the right answer. Then, just like a personal assistant, Siri provides you with the information you need. 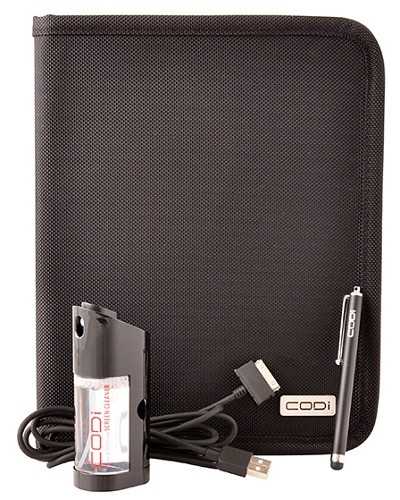 Protect your iPad 4 in tailored style with the best fashion-friendly FitFolio case! Comfortably use your iPad in your classroom, dorm or office.